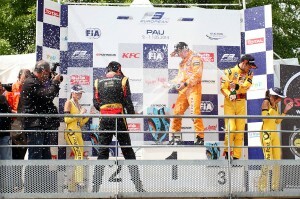 Felix Rosenqvist fought back from his recent misfortunes by storming to victory in the prestigious Grand Prix de Pau on Sunday afternoon, becoming only the second Swede in history to win the French street race and securing his first FIA Formula 3 European Championship triumph of the year in the process. Rosenqvist started Sunday’s finale from second on the grid, but immediately out-dragged local hero Esteban Ocon off the line to grab a lead he would never surrender. The 22-year-old Mücke Motorsport man controlled the event throughout, overcoming a gearbox glitch to survive a safety car restart on his way to victory, while further underlining his pace by setting the fastest lap of the race. The win sees Rosenqvist join Reine Wisell into the history books as only the second Swede to have won the Grand Prix de Pau, 43 years after the ex-F1 driver emerged victorious in 1971. In the build-up to Sunday’s Grand Prix, Rosenqvist was held back by a mixture of unfortunate scenarios, which included him being thrown into retirement when he was hit by Ocon while attempting to pass the Frenchman for the lead in the preceding second heat. On his way to victory, Rosenqvist also topped his group in Saturday qualifying, heading the timesheets by a full 0.350 seconds. The next round of the FIA Formula 3 European Championship takes place at Budapest’s Hungaroring on 30 May – 1 June.